I finally broke down and grabbed a Pelikan demonstrator and immediately equipped it with a juicy 14b Bold (i think i went a size up, too, to a 300 or 400 nib). 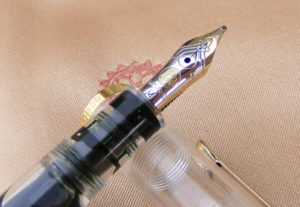 What can i say – it’s a Pelikan, and it’s a workhorse. 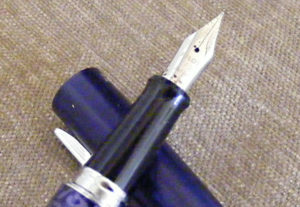 My only quibble is I bought the nib in my ‘bolder is better phase, but in day-to-day writing, this darling doesn’t get as much use as it would if the nib were a bit smaller. But I love it! This is one of the ‘soft-fine’ nibs from Pilot that is supposed to strike a balance between flexy nibs and stiffer writers. It can yield some nice variations, but next to a true vintage ‘wet noodle,’ it still seems to take more effort than it should.It took me a while to warm up to this pen, but now it’s a regular in the rotation, but not so much for its flex properties, but just because it’s a darned fine pen! It’s a Metro – cheap, solid, reliable. And purple leopard! What’s not to love? I have several of these lying about, but I like the purple one the best. 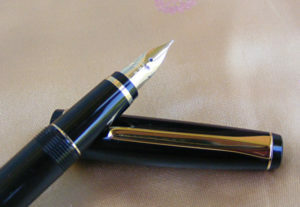 It’s a good, solid pen, writes beautifully, has a good solid heft, and a range of very attractive finishes. What makes it remarkable, it the price point; under $20. This pen can hold its own against any number of much pricier pens. I picked this one up in LA, in a fine no less! (Fine nibs usually don’t suit me, but this one is smooth and wet enough for me, but still gives me the fine line I prefer for annotating in books (yes, I do that; I’m an academic!). Worth every penny and then some! My only quibble (and for about $15, it’s a small quibble) is that the finish on these is a little fragile; I had a sizable ding in the finish only a few weeks in, and I tend to baby my pens….